Gabriel's Clock by Hilton Pashley. Review: Watch out for demons! 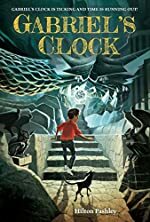 In Gabriel's Clock by Hilton Pashley, Jonathan and his new friends must stop Belial and his minions from the destroying the village of Hobbes End. Read this adventure novel and join Jonathan in saving both the village and his family. In Gabriel's Clock, Jonathan, who all his life believed he was normal, and his family are assaulted by faceless demons. Jonathan's mother brings him to Hobbes End, a village that is highly secured, and abandons him there to seek help as his dad fights off the monsters. Jonathan soon discovers that he is half angel, half demon, and the arch demon Belial desires to use him as a powerful weapon to demolish Heaven. Teamed up with new friends from the community, Jonathan has to defeat Belial to save the small town-and his family. Will the forces of Belial and his Corvidae servants wreck Hobbes End and Jonathan's family? Or can Jonathan gather the power inside him to rescue those he loves? Find out by reading this action-packed book. Gabriel's Clock is a thrilling book and there is so much that make it interesting. For example, the setting, a village, has unusual features, such as a lake with glass and a crater at the bottom and a dark forest. These aspects set up the perfect hiding place for the Corvidae. Also, the characters make the novel amusing because they are special-Jonathan is half angel, half demon, Cay's dad is a werewolf, and Elgar is a talking cat. Because the characters are unique, they create suspense, which makes the book more enjoyable. In addition, the author, Hilton Pashley's, style of writing keeps the story fascinating because he switches between from the townsfolk's' point of view and the devils' point of view. He also wrote in third person omniscient. These characteristics produce excitement throughout the story by letting the reader know what both the villagers are doing and thinking and what Belial is doing to shatter their plans. I recommend this book to everyone who is 8-11 years old because there are both boy and girl characters in the story and Gabriel's Clock. is an easy read. In conclusion, Gabriel's Clock by Hilton Pashley is a compelling read filled with dramatic events. Wait a minute-is that a demon? AH! We would like to thank Houghton Mifflin Harcourt for providing a copy of Gabriel's Clock for this review. Have you read Gabriel's Clock? How would you rate it?